BEIJING • Japan's reported plan to develop a new land-to-sea missile is a sign the country may be eyeing a shift to an offensive defence posture, said a Chinese state-run newspaper, quoting mainland analysts. The Global Times yesterday also ran a hard-hitting editorial, slamming the plan as one that would restrict freedom of navigation around the Miyako Strait. It called the move "unacceptable" and decried what it called "double standards" by Japan. "Japan's aggressive plan has barely met any opposition. In stark contrast, China's deployment of some land-to-air missiles in Yongxing island in the Xisha Islands for self-defence has been radically protested (against) by the US and Japan," said the editorial, referring to the deployment of HQ-9 missiles to the Woody Islands of the Paracels. The Miyako Strait is a strategic waterway which lies between Miyako island and Okinawa island. At 257km wide, it offers Chinese naval forces a direct route to the western Pacific, particularly vessels from the Qingdao-based North Sea Fleet and Ningbo-based East Sea Fleet. The strait is one of various waterways along the "first island chain", which refers to the first major archipelagos off the East Asian continental mainland, including the Japanese archipelago, Ryukyu Islands, Taiwan and the northern Philippines. In the 1950s, the US came to regard the chain as an important barrier to contain China and other communist countries. There has been no official confirmation in Tokyo of the missile plan, which was first reported by Yomiuri Shimbun on Sunday. The top-selling Japanese daily did not say where it got the information from. Yomiuri said that Tokyo plans to deploy the weapon on islands such as Miyako in Okinawa prefecture to bolster the defence of disputed islands in the East China Sea. It said the new missile's reported range of 300km will cover the disputed Senkaku Islands, which are called Diaoyudao in China, adding that the deployment is expected by 2023. 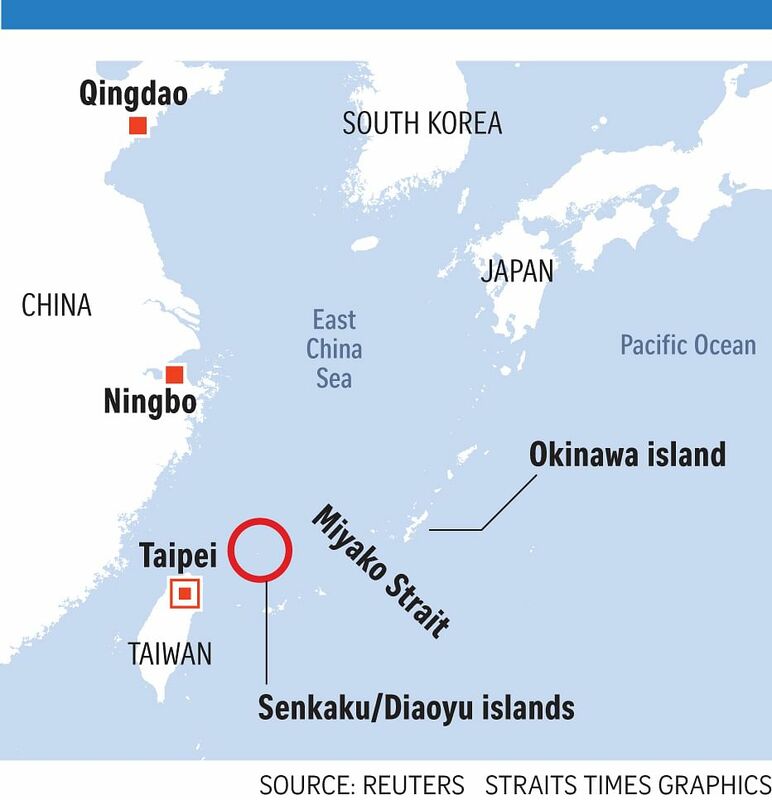 Ties between Japan and Beijing have become strained in recent months following what Tokyo calls "intrusions" by Chinese ships in the territorial and contiguous waters off the rocky islands. "Though Japan claims it is for defence purposes, the missiles increase Japan's capability to shift from a defensive to an offensive posture," said Mr Da Zhigang, director of the Institute of Northeast Asian Studies at the Heilongjiang Academy of Social Sciences. He told the Global Times that with a range of 300km, the new missiles could target China's coastal areas. Professor Zhou Yongsheng at the Institute of International Relations of China Foreign Affairs University said if the reported 300km missile range were true, it would mean that Japan is "ready for a hard fight". "The range is higher than that of Russia's S-300 surface-to-air missile system, and better than China's current surface-to-air missile system," Prof Zhou told Global Times. "Japan is trying to use the missile system to lock down the Miyako Strait and prevent Chinese forces from entering the Western Pacific Ocean." Mr Da said that the missile plan is similar to the deployment of the US Terminal High Altitude Area Defence (Thaad) system on South Korean soil. Beijing opposes the deployment which it sees as a US move against its own national security interests. Thaad's powerful radar can extend into Chinese and Russian territories, reported the Xinhua news agency.